When starting your freelancing career, you may find yourself so excited to land those first clients that you proceed to work without a formal freelance contract. Since the client already knows the work they want to have done, has informed you of their deadline and agreed to your hourly or project rate, what's the point of putting it in writing? While most client engagements go off without a hitch, creating a freelance contract allows you the benefit of documenting your agreement, and having protections in case anything happens that impacts your ability to perform the work as originally promised. 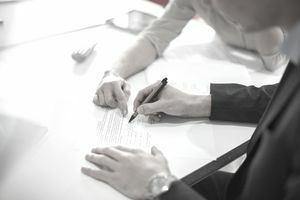 You may find it tempting to skip the contract creation, especially if your client came from a solid referral source or happens to be a good friend. However, developing a freelance contract offers several benefits for both you and your clients. In a nutshell, a contract prevents potential confusion, removes ambiguity, provides structure, and builds trust between you and your client. While the vast majority of projects may run smoothly, proper contract language can address and prevent issues such as clients that sometimes change the terms mid-project, decline to pay you or make differing claims about what they expected to be included in the final work product. Well-crafted contracts keep you safe from something called "scope creep," which happens when the client keeps adding more details and work to their original request, pushing the project out of control regarding both time and payment for your efforts. Getting your client to sign a contract spelling out when and how much they'll pay you, and the deliverables, affords you the benefit of verifying that your client is serious about moving forward. Clients that carefully review and willingly sign a freelance contract show you that they trust and respect you. A detailed contract protects you from legal liability and other potential trouble. If you waffle at the thought of asking your client to sign a freelance contract, not wanting to risk their potential disapproval, realize that clients who won't sign a contract are sending up a major red flag and likely won't be worth your time and effort. Your contract offers your client protection as well because you state what you're providing to them, and obligate yourself to live up to those expectations. You can use the contract terms to manage your client's wants and needs regarding details like work-update frequency, project scope, how quickly you need them to respond, their designated point of contact, and how you will work with them through any disagreements. Contract terms vary widely depending on the industry, project type, and many other details. However, a certain number of factors show up in all good contracts, offering best practices for any contract you write. Write your freelance contract in simple English, avoiding the use of jargon or complex statements that could create ambiguity. Put your contract in a concise format using headings, bullet points, and brief language wherever possible to stay focused on key points, and avoid wordiness that could be incorrectly interpreted. Avoid general statements and keep your language focused and specific, adding details wherever necessary to avoid confusion and misinterpretations. Clearly define the project and detail the work involved to verify that you have understood your client's needs and wants correctly. Spell out roles and responsibilities for both yourself and your client so that both sides know what they're expected to contribute going forward. The following sections will take you through creating a contract template for your freelance clients. Once you complete your template, you can adapt it for various future freelance assignments and clients with a minimal amount of effort or headaches. Identify your document by typing something such as CONTRACT AGREEMENT, SCOPE OF WORK or other fitting variation in large font size (larger than the rest of your contract type) at the top of your document. On the left side of the page, type your business name, your name and title, and all relevant contact details. On the right, type complete contact information for your client and the date. Assign the project a job number for your records and associate the job number with a specific client and a specific scope of work. Also, include this information in your contract for easy reference. <Jill Freelancer> (“Contractor”) will provide <ABC Widgets, Inc .> (“Client”) with <work product> and <any additional work product> as dictated by the specifications detailed in the Terms and Conditions below. Project work will commence on <start date>. <Freelancer> agrees to provide services and deliverables to <client> within the guidelines of the scope, deadline, quality, and pricing as outlined within the contract terms detailed below. <Insert details of the scope, work milestones and deadlines, services provided and fee schedule>. If the project's scope or other work details change beyond the original agreement, <freelancer> and <client> may renegotiate the contract to account for changes to the project work. Invoices will be generated <monthly> and transmitted to <client> from <freelancer or business name>. <Freelancer> may require a <deposit or retainer, whichever fits your situation> before the commencement of work. This deposit will be approximately <X percent> of the expected total project billing. Work will not begin until receipt of deposit. <Freelancer> accepts payment via bank account ACH transfer, credit card, debit card, or PayPal. <Freelancer> requires payment of all remaining fees upon completion of the work and final deliverables. Update the above text to reflect your preferred payment methods, and choose whether to ask for final payment before delivering final work, or upon delivery. Certain types of projects, such as a software implementation, require project plans with work and labor hour estimates for each project phase. If applicable, include this detail with itemized costs and labor-hour estimates as an appendix to your contract. Invoices outstanding after 90 days will be subject to an interest rate charge of 1.5 percent per month. Include your procedure for handling work that exceeds either yours or the client's hourly estimate. If the client wants you to spend more time, for example, you can state that you will document the additional work and fees in a separate contract, or add a signed addendum to the existing contract. On the other hand, if you estimate three hours of work at $100 an hour, but completion actually takes eight hours, you're going to have a hard time convincing the client to honor their end of the deal, so detail a constructive process to address this situation. If you don't already know this, you will soon learn that it works to your benefit to use a contract drawn up by yourself rather than the client. Be wary if a client wants you to use their contract that may contain terms favoring them at your expense, and also be on the lookout for any additional language your client might want to add to your contract that slants things in their favor. <Freelancer> may use the finished works as part of his/her portfolio to develop future business, with consent and approval from <client>. If <client> chooses to cancel the project, <client> is held liable for any fees related to all work created and produced up to the cancellation date. <Client> must submit cancellation in writing, with at least <X days> notice. All documents and supporting information provided by <client> to <freelancer> will remain confidential unless part of final work intended to be published or distributed. Any form of a non-disclosure agreement (NDA) provided by <client> and signed by <freelancer> will supersede this contract clause. <Freelancer> may establish links to published or publicly-distributed work for his/her website, social media, online portfolio or other locations, unless <client> makes a request declining this activity. <Freelancer> will honor all such client requests. I, <client>, acknowledge and accept the terms of work outlined in this contract. Add two signature lines at the bottom of the contract. Use one for you, with your name typed below the line, and one for your contact person at the client, with their name typed underneath the line. The completed signatures will indicate that you and your client accept each other's terms. If you conduct your business via email, as freelancers rarely meet their clients in person these days, ask the client to sign the contract and email it back to you. Sign the contract before sending, so they will have your signature on their copy. You can save the contract in .pdf, Microsoft Word or Google Docs format and email it, send a paper copy via overnight mail, or if you and your client still have fax machines, exchange signed documents via fax. Sometimes things come up, either for you or the client, that cause one party to cancel the work. You might have an ongoing contract for several months, and receive an email one day from the client requesting that you stop all work, immediately. Conversely, you may decide that a client just isn't working out, or you need to switch the direction of your business, so define a process to terminate your work with your existing clients. Even if a client project has worked out well, it may be time to wind-down work or wrap up for other reasons. <Client> may terminate this contract, or a portion of work covered by this contract, at any time without liability by giving <X days> notice to <freelancer>. <Freelancer> may terminate this contract prior to completion, by giving <X days> notice to <client>. This type of clause allows you or the client to exit the freelance contract at any time if the relationship doesn't seem to be working out. Should a client not pay within the time you specified in the contract, send a formal, friendly letter along with a copy of the signed contract. When asking for payment, reference the contract and the fact that the contract outlined your payment terms. Having a contract does not provide bulletproof protection. However, it can help you in many ways, should you ever have a client that refuses to pay, or otherwise doesn't conform to your original agreement. If someone has breached a contract and you have exhausted all your collection and other options, consult an attorney.